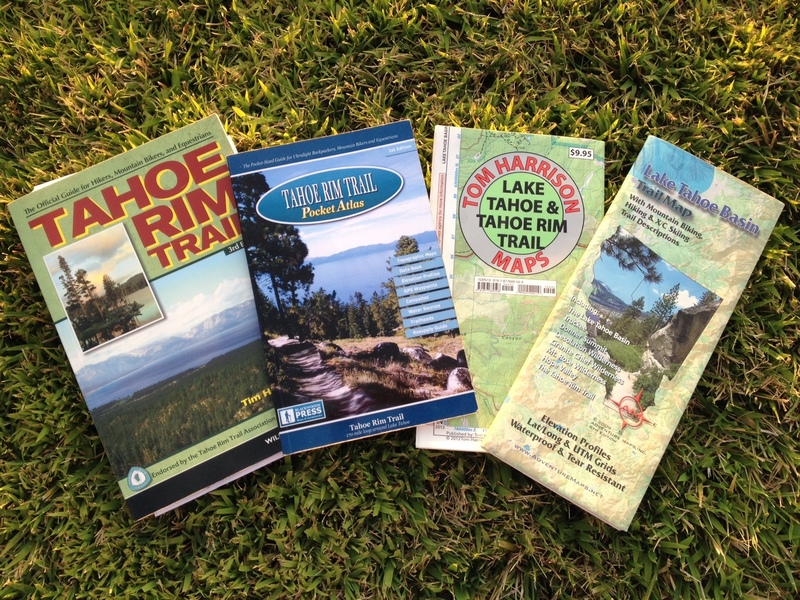 There are many helpful resources to navigate the Tahoe Rim Trail (TRT), but if only there was a resource to help navigate the resources! I collected four helpful guides while preparing for my Tahoe Rim Trail thru-hike. Everyone has different preferences but here are my thoughts on these four. This book is a good resource for thru and section-hikers alike. There is great information about the flora and fauna of the area, permits and regulations, seasonal information, and more. However, one huge frustration came after reading through the first hiking section, Tahoe City to Brockway Summit, there was zero mention regarding potential camp locations. I wish Hauserman would put a little more energy into potential into camp locations and a little less into describing every type of tree you pass on the trail. However, I did appreciate the random fun facts, for instance I now know the viewpoint of the official opening ceremony for the TRT on September 22, 2001 – about four miles east of the Brockway Summit Trailhead. I would recommend this guide, especially if you’re not familiar with the area. The Tahoe Rim Trail Association (TRTA) also endorses this guide, their executive director even wrote the foreword for the third edition. While on the John Muir Trail (JMT) we befriended someone that had a Blackwoods Press atlas for the JMT. The atlas looked extremely handy with potential camp locations and water sources noted on the map, all packed into a lightweight booklet. After my frustration with the Hauserman guide I decided to spend the excessive amount on the Tahoe Rim Trail: Pocket Atlas package deal. I chose on the whole package, as opposed to just the atlas, since it was on sale and only $10 more at the time. What I was mostly after in this package was the possible thru-hike itinerary. But don’t worry about spending the extra money for an itinerary now – you have access to my TRT itinerary! Anyway, this atlas was incredibly helpful for planning our trip and while on the hike. I do have a few complaints though – there were poor page breaks that left some information off the map or covered by the elevation profile, some of the mileages were off (or we REALLY had our trail legs under us), and a few days into the trip pages started falling out of the atlas. I look forward to seeing the second edition though, since it was still a helpful resource. If I’m in the market for a map, the first thing I check is if Tom Harrison has published one for the area. Thankfully for the Tahoe Rim Trail, I was in luck! These maps are light-weight, durable, easy to read with mileage. One of my fellow thru-hikers carried this map on the trip. I would always recommend a Tom Harrison map without hesitation. I picked up this gem as a thank you from the TRTA when I led a Leave No Trace course for them in 2011. The map includes the TRTA logo, so it has their seal of approval – a good sign. It also has my seal of approval; it’s great for finding hikes in the Tahoe area and even a little beyond. I used it to find trails near Donner Lake and Hope Valley. There are suggested hikes and bike rides with elevation profiles and mileages between points on the map. This resources packs a wealth of information into one map, it would be a bit much if your carrying it on a thru-hike, but I’d still highly recommend it for planning day trips around the area. Do you have any favorite Tahoe Basin resources?